Good afternoon! After a death march of a road trip, the Red Bulls are finally back in MLS action @The Cathedral of Football against the hapless Toronto FC (8:00pm ET, MSG+). Let's see how both teams come into this one. Toronto is firmly entrenched in the bottom half of MLS' weak Eastern Conference (7th place, 18 points). TFC has actually won it's last two games (both against the dead-last Whitecaps) and will look to keep rolling in NY. Looking to turn their fortune around, the Canucks have recently signed two Designated Players. Unfortunatly for them, said DPs will not be able to play until the MLS transfer window opens (July 15th). As far a RBNY fans are concerned, TFC is ripe for a thrashing. I know we've been saying it all season, for every home game, but the Red Bulls absolutely MUST get all three points against Toronto FC tonight. Do I have any confidence that they will? Not really. We have a knack of playing down to the level of our opposition and still haven't come up with a solution at the goalkeeper position (get a move on, Soler). I'll predict another 2-2 draw. Goals for us by Henry and Richards, TFC with a Mendes own goal and questionable penalty. Come on Red Bulls, for the love of God prove me wrong! I'm calling it right now: Red Bull NY victory. I'm not going to predict the score, but I know that it's gonna be a win. 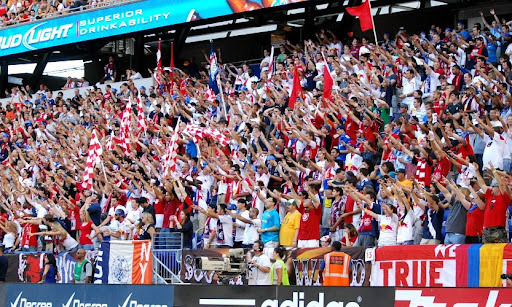 Just thinking about TFC and their fans coming in to Red Bull Arena and taking anything away from the match makes me throw up in my mouth a little. It's become difficult to predict anything but a draw until our keeper situation is straightened out, but I'm going to put on the fan blinders and just say 2-1 Red Bulls. Henry and Lindpere show everyone how it's done. Dax McCarty and Roy Miller with the assists. Finally, we're back at home. Toronto hasn't won beaten a team that isn't Vancouver since May 7th when they beat Houston at home, and is one of five teams who still have not won on the road. Word is we'll have Luke and Thierry back, and maybe even Rafa in the back four. Be still my heart, will we have our best XI on the field? And can they do anything? Trying to stay positive - 2-1 to the Bulls. Richards and Rodgers for us, and Tchani (if he's healthy) for Toronto just to make whatever dumb goal we give up that much worse. I predict we'll find some way to lose this one by a one goal margin. That's all for now. Look for our Award Winning coverage in the next day, or two. I hope to see you all @The Cathedral of Football, Red Bull Arena (built by Makita). Viper Out!